The invention concerns dendrimeric graft polymers based on base carriers containing hydroxyl groups and on the surfaces of which polymers are covalently bound, the following conditions applying: a) the base carrier contains aliphatic hydroxyl groups; b) the covalently bound polymers are bound by an end-position monomer unit to the basic carrier; c) the polymers at the branching points of the dendrimeric structure contain monomer units of formula (II); and d) the dendrimeric polymers contain monomer units of formula (III); R?1, R2, R3¿ independently of one another stand for H or CH¿3, R?4 stands for H, C¿1?-C5 alkyl or C6-C12 aryl, n is an integer between 1 and 5, one group X is OH and the other group X is an end-position monomer unit of a further polymer chain, and Y stands for a group containing a separation effector. The invention also concerns the production of these dendrimeric graft polymers and their use as separating agents for liquid chromatography. The invention relates to dendrimeric graft polymers and their use as separation materials for Flüssigkertschromatographie. From DE 38 11 042 Separating materials for chromatography, are known, having linear graft polymers. These materials exhibit compared to isolating materials containing crosslinked polymers distinct advantages. The object of the present invention is. provide separation materials with improved properties. H or CH 3, R 'is H, d-Cs-alkyl or C 6 -C 12 aryl, and n is an integer between 1 and 5,. It has been found that these activated support materials for the inventive graft polymers with dendritic structure umset¬ zen can be. In this case linear polymers are grafted (polymer chain second generation) to the known graft polymer with a linear polymer chain (polymer chain of the first generation), in turn, this step may be repeated multiple mehr¬ (Por realize tten higher generation). ORIGINAL DOCUMENTS To branched graft polymers, however, have no crosslinking occur. In addition, as provided for chroma¬ tographischen separation processes, separation effectors are introduced. The resulting separation materials exhibit improved properties. Y is a radical which contains a separation effector means. wherein Ri, R2, R3, R and n have the meanings already mentioned; b) at least partially reacting the oxirane groups in diol groups; c containing the effectors Separations¬) grafting of further monomer, for example, from further monomers of the formula I, or monomers, ions cerium IV in the presence of; d) optional, and multiple repetition of steps b) and c); e) introduction of radicals by means of separation, to the extent they are not already introduced by the grafting reaction with monomers containing separation effectors; f) optional ring opening remaining oxirane groups. The invention relates to the use of the dendrimeric graft polymers according to the invention in the separation of mixtures min¬ least two substances, in particular for the separation of biopolymer mers, by liquid chromatography, in particular by means lonen- exchange and affinity chromatography. Another use of the invention is the separation of low molecular weight analytes from protein-containing matrices. 5 The invention relates to methods for separating mixtures of at least two substances, in particular for the separation of Biopoly¬ mers, by liquid chromatography, in particular by means lonen- exchange, hydrophobic interaction or affinity chromatography, using the dendrimeric merisaten Pfropfpoly- Q according to the invention. Other methods of the invention relate to the separation of low molecular weight analytes from protein-containing matrices using inventive dendritic release materials. 5 Figure 1 shows the dependence of selectivity α (curve A) and Bin¬ binding capacity (curve B) of diethylamine-substituted (DEA) Ionen¬ exchangers with different degree of branching (sample number as abscissa). The experimental details are found in application example A. It is found that the selectivity of branched material is significantly higher than that of unbranched material. The binding capacity decreases compared with unbranched reference material, with low branching, but falls off significantly with strong branching. Figures 2 and 3 show the experimental setup for the separation of analytes from biological matrices, such as serum or plasma, using inventive separating materials. Figure 4 shows the results of a recovery test by using a separation material prepared according to Example. 9 Further experimental details are given in Example B. The dendrimeric graft polymers according to the invention are distinguished by a tree-like branched structure, wherein a first linear polymer contains a base support contains aliphatic hydroxyl groups, is grafted. In this case, monomers of the formula I, wherein the radicals R 1, R 2, R 3 and R 4, and n have the meanings already mentioned, grafted in the presence of ceric ion, whereby a linear polymer Pfropf¬ arises. 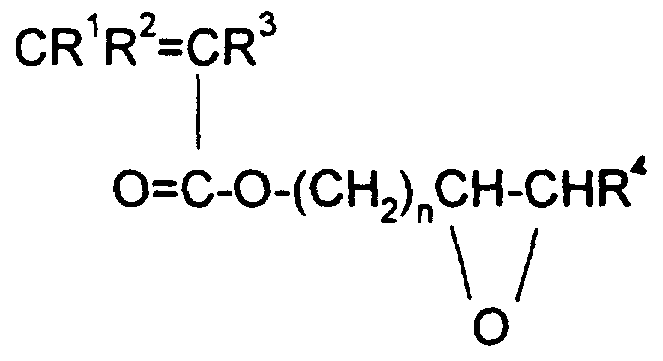 The basic features of this reaction are by G. Mino and S. Kaizerman (1958) J. Polymer Science __1, 242-243, and G. Mino et al. (1959) J. Polymer Science __, described 393-401. The polymer initially contains oxirane radicals, which are then reacted completely or partially to diol groups. To a treatment with dilute sulfuric acid is preferred. of formula I may thus to the resulting aliphatic hydroxyl this Poly mers (first generation) now again monomers in the presence of cerium IV ions are polymerized. The resulting polymer (second generation) is linear in themselves. However, the overall structure is branched. In order to reach even more branched dendrimeric graft polymers, the steps above can be repeated: Um¬ reduction of the oxirane groups in diol groups and polymerization of monoethylenically mers of formula I in the presence of cerium IV ions. [(CH 2) π. -O-] 0 -R 9, wherein m is 2 or 3, o is an integer between 1 and 200 and R is H or CrC mean 5 alkyl. especially radicals of medium or low hydrophobicity are preferred. These residues can be introduced as alkyl or aryl groups as alkoxy or aroxy radicals or as Alkoyl- or aroyl radicals. d) For the gel permeation chromatography are hydrophilic compounds Verbin¬, preferably form the pores or networks used as a separation effector. These include (meth) acrylic acid derivatives such as acrylamide or methacrylamide, (2,3-dihydroxypropyl) - methacrylate or N- (2-methoxyethyl) acrylamide or N- (2,3-dihydroxypropyl) acrylamide. In addition, these include cyclen vinylated hetero-, such as 1-vinylimidazole, N-vinylpyrrolidone, 2-vinylpyridine, 4-vinylpyridine, 4-vinylpyrrolidone-N-oxide. Separation of analytes from biological matrices. Oxiranresten that are present after polymerization, with compounds of the formula I, incorporated in the carrier; including: a1) the reaction with sulfurous acid or its salts or with primary, secondary or tertiary amines, wherein arise lonenaus- exchanger; a2) the reaction with iminodiacetic acid or the introduction thiophilic ligands, or other Affiniätsliganden such as protein A, which arise carrier for affinity chromatography; a3), the reaction with alcohols, phenols, or primary amines, wherein hydrophobic release materials arise. Hydrophobic separation effectors can be for example also by Esterbindungen of hydroxyl groups, as are formed by hydrolysis of the oxirane moieties introduce. 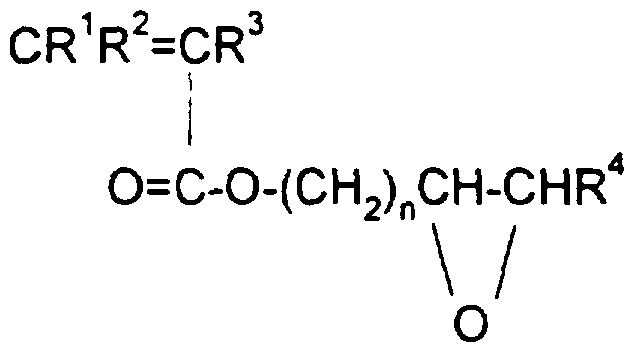 R 8 CrCio-alkyl amino with an amino, monoalkylamino, dialkyl, trialkylammonium, carboxyl or sulfonic acid group is substituted,. Rs dC-io-alkyl, which is substituted by an amino, monoalkylamino, dialkylamino, trialkylammonium, carboxyl or sulfonic acid radical. Preferred monomers of formula V are those in which W has one of the following meanings: OH, NH (CH 2) 2 N (CH 3) 2, NH (CH 2) 2 N (C 2 H 5) 2, NH (CH 2) 2 N + (CH 3) 3, NHC (CH 3) 2 CH 2 S0 3 H or NH (CH 2) 2 S0 3 H.
After the reactions described were carried out, remaining oxirane radicals can be hydrolyzed, if desired, for example by a final treatment with dilute sulfuric acid. Without further elaboration, it is believed that a man Fach¬ can utilize the above description in the broadest scope. The bevor¬ ferred embodiments should therefore merely as illustrative, and not to be construed as in any way limiting. The complete disclosure of all applications mentioned above and below, patents and publications, in particular the German application P 43 34 351, filed on 08.10.1993, are incorporated by reference into this application. 15-30 ° C. The Polymeriation is in a three-necked flask of suitable size equipped with a stirrer, dropping funnel and thermometer executed. is washed by suction on a glass frit (G2). Mixture of 180 ml of water and 3 g of HN0 3 (65%)) were mixed with vigorous stirring at room temperature. After 1 minute, adding a solution of 6 g of (2,3-epoxypropyl) methacrylate in 44 ml of dioxane. Stirring is continued for one hour. Subsequently, the reaction product is washed twice with 200 ml of water, three times with 100 ml of acetone and three times with 200 ml of water. Example 1 are hydrolyzed with 200 ml of 0.5 M sulfuric acid (1 hour, 50 ° C), and thus converted the oxirane groups in diol groups. On closing is washed three times with 200 ml of water. Are mixed with 3 g of ammonium To a suspension of 100 ml of sedimented material from Step 1 and 66 ml of water (IV) nitrate (dissolved in a mixture of 180 ml of water and 3 g of HN0 3 (65%)) at room temperature under vigorous stirring. After 1 minute, adding a solution of 6 g of (2,3-epoxypropyl) methacrylate in 44 ml of dioxane. Stirring is continued for one hour. Subsequently, the reaction product is zwei¬ times washed with 200 ml of water, three times with 100 ml of acetone and three times with 200 ml of water. The result is a simple branched dendrimäres material Oxiranresten. The material from Example 3 is again subjected to the reaction sequence described in Example 3. FIG. The result is a two-branched den¬ drimäres material Oxiranresten. 100 ml and isolated by filtration gel prepared according to Example 3 (monobranched) are suspended in 100 ml of water and 100 ml of diethylamine added. Then, 20 hours, further stirred at room temperature. Thereafter, the reaction product is washed twice with 100 ml of water. The washed reaction product is suspended in acid solution 100 ml of a 0.5 M sulfuric acid and stirred for two hours at 40 ° C slowly. Thereafter, 0.25 M phosphate buffer (pH 7), then washed until neutral with water. The gel is stored in an aqueous suspension with addition of 0.02% sodium azide. 100 ml and isolated by filtration gel prepared according to Example 4 (two-branched) are reacted with diethylamine as described in Example 5 in. In a corresponding manner are also highly branched with diethylamine substituted dendrimeric release materials available. 100 ml gel produced according to Example 3 M sulfuric acid are suspended and stirred for one hour at 45 ° C in 160 ml of 0.5. It is then washed three times with 500 ml of water. 10 g of NaOH are dissolved in 200 ml of water and 2-acrylamido-2-methylpropanesulfonic acid was added until the pH is 4 (ca. 45 g; Monomeren¬ solution). As for the polymerization initiator solution to 8.2 g of ammonium cerium (IV) nitrate 0.5 M nitric acid dissolved in 50 ml. 10 g of a LiChrospher® Si 60, particle size 25 microns, having a specific surface area of ​​380 m2 / g and a mean pore diameter of 9 nm (E. Merck, Darmstadt) are suspended in toluene 50 ml and, after addition of 3.8 ml ( 4 mmol / m 2) Gycidyloxypropyl-methyl-dimethoxysilane boiled for 5 hours under stirring. After aspiration of the material it is washed toluene and methanol and dried. Stage 2: Ring opening of the carrier to glycidyloxypropyl diol phase The product obtained from step 1 is dissolved in 50 ml of a 5% sulfuric acid solution and boiled at reflux for opening the epoxy ring 3 hours under slow stirring. After aspiration the reaction suspension, is washed with water until free of sulfate and dried after re washing with methanol. (Corresponding to 2.81 mmol / mΣ diol groups carbon content 7.6%) gives a diol carrier. 40 ml of gel from step 3 are suspended in 160 ml of 0.5 M sulfuric acid and stirred for one hour at 45 ° C. It is then washed three times with 500 ml of water. One minute, the addition of a solution of 1, 2 g (2,3-epoxypropyl) - methacrylate in 15 ml of dioxane. Stirring is continued for one hour. Anschlie¬ ßend the reaction product is washed twice with 200 ml of water, three times with 100 ml of acetone and three times with 200 ml of water. Ligand 5 g of the dried carrier material from step 5 are suspended at 0 ° C in dry chloroform. To this solution 60 ml are added triethylamine overall dried. Then a solution of 2 g of stearoyl chloride in 25 ml of chloroform under cooling at 4 ° C, added over a period of 3 hours. After the addition of the acid chloride is stirred for 48 hours at room temperature and then the gel is washed with 50 ml of chloroform, methanol, water and methanol and dried. 40 ml of gel from step 6 are suspended in 160 ml of 0.5 M sulfuric acid and stirred for one hour at 45 ° C. It is then washed three times with 500 ml of water. In the manner described above, a dendrimeric shielded phase separation material is provided, which hydrophobic residues are shielded by hydrophilic Diolgruppierungen. The following application example shows the effect of Verzweigungs¬ degree on binding capacity and separation capacity of the separator material. Monosubstituted to seven-branched DEA-derived separating materials (Samples 2-7) are prepared in accordance with Examples 5 and 6, unbranched comparative material (sample 1) is prepared in analogy to Example 5, using the linear polymer of Example 1 instead of the dendrimeric oxirane-containing polymer becomes. These release materials are respectively in a Superformance ^ glass column (10 mm x 50) and filled with the application buffer (50 mM TRIS buffer, pH 8.3) equilibrated. A solution of bovine serum albumin (10 mg / ml) in this buffer is applied continuously (flow: 0.5 ml / min) was measured by photometry at 280 nm and the elution. From the breakthrough curve, the capacitance is determined. The separation behavior of bovine serum albumin is also determined and expressed as a selectivity factor α. The results are summarized in Figure 1. It is shown that the selectivity α (curve A) of dendritic material is significantly higher than of unbranched material. The binding capacity (curve B) increases as compared to unbranched comparative material, with a low branching, but decreases significantly at high branching. 0.05 M Na-phosphate (pH 4.0) / acetonitrile (80:20; V: V); Detection UV 210 nm. After injection of the plasma sample (100 ul) of the autosampler (5) to the "L" of the switch valve (6) reaches the sample with the aid of by the HPLC-pump (3) supported pre-column buffer ((1); flow rate 0 , min) on the precolumn (7) 5 ml /. The analyte (carbamazepine) is selectively retiniert from the release material the pre-column, while Matrix¬ ingredients, especially proteins are eluted within 12 minutes into the waste container (11). After switching of the valve (6) in position "I" is the analyte by using the HPLC-pump (4) conveyed analysis buffer ((2); flow rate 0.8 ml / min) within 5 minutes completely from the precolumn (7) eluted and transferred to the downstream analytical column (8). B: a plasma sample (human plasma) containing also 0.5 ug carbamazepine. As can be seen, the analyte is found completely wieder¬ in the plasma sample. Ri, R 2 and R, are independently H or CH 3, 5 R 4 H, CC 5 alkyl or C 6 -C 12 aryl, and n is an integer between 1 and 5, b) at least partially reacting the oxirane groups in o diol groups; c containing separation effectors) grafting of further monomer, for example, from further monomers of the formula I, or monomers, ions cerium IV in the presence of; d) optional, and multiple repetition of steps b) and c); 5 e) introduction of radicals by means of separation, to the extent they are not already introduced by the grafting reaction with monomers containing separation effectors; f) optional ring opening remaining oxirane groups. 0 3. dendrimers graft polymers according to claim 1 or 2, characterized in that the separation effector contains an ionic or ionogenic group. Rs, R 6 and R 7 independently of one another dd alkyl, wherein one or both radicals R or R ~ can also be H, mean. 6. dendrimers graft polymers according to claim 1 or 2, characterized in that the radical Y includes an affinity ligand. 7. dendrimers graft polymers according to claim 1 or 2, characterized in that the radical Y contains a hydrophobic residue. 8. The use of dendrimeric graft polymers having the features of claim 1 or 2 in the separation of mixtures of at least two substances, in particular for the separation of biopolymers, by liquid chromatography, in particular by means of ion exchange, hydrophobic interaction or Affinitäts¬ chromatography. 9. Use according to claim 8, wherein said analytes are separated from biological matrices. wherein steps b) and c) can be repeated several times or even once, and d) introduction of the groups containing the separation effectors, if this is not already done by the grafting reaction with monomers of formula V.
12. The method of claim 11, wherein said analytes are separated from biological matrices.